On the first night of Don Smith’s Big Sur workshop last week, Don and I gathered our group at (aptly named) Hurricane Point above Bixby Bridge for a round of night photography. 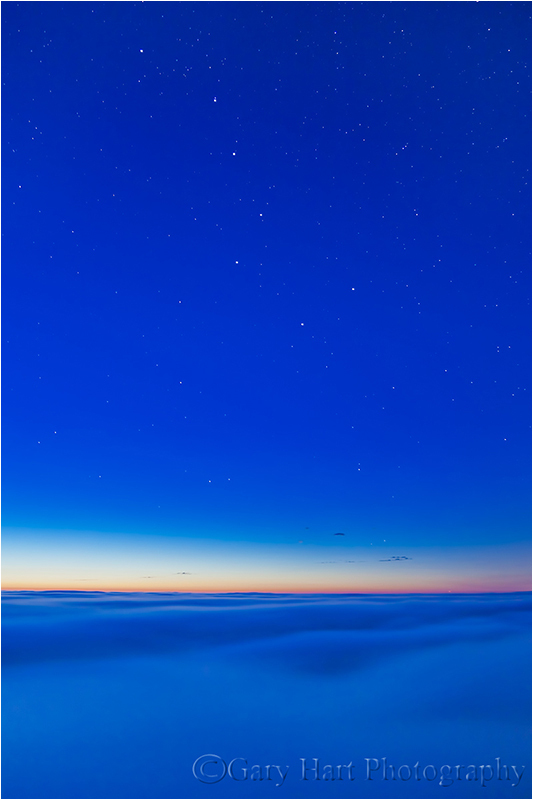 While the stars were already out in force as we set up, the last light of day persevered on the western horizon, softly illuminating the sea of fog blanketing the Pacific. The fog, which in California summers lurks offshore by day, was making its nightly assault on the coast. On this evening, under the cover of darkness, it was in full-out attack mode. Rushing to determine the exposure settings for our group of inexperienced night photographers, I managed to fire off three frames before the charging fog engulfed us and we aborted the mission. I wasn’t sure I’d captured anything of value in my haste until I returned home and found this. It’s a 25-second, 400 ISO exposure that underscores the camera’s ability to accumulate enough light to reveal color beyond the ability of the human eye/brain. In other words, this is pretty much the way my camera saw it: My processing was limited to a slight cooling of the light temperature in the Lightroom raw processor, fairly mild noise reduction, a small wiggle in Photoshop Curves for contrast, and a little dodging to bring out more detail in the fog. Each time I look at this image it revives some of the emotion of being there. ← Rules are great, but…. I really enjoy your photography and you sharing of your experiences. I am (probably) twice your age and learning the things that you have already mastered. Thank you for sharing. Great shot! I was so slow that my camera didn’t make it to the tripod. Thanks to you and Don for a wonderful and inspiring workshop. Thanks, Mary Jane, it was great seeing you in another workshop. On your shot of the “Almost Heaven” what “F” stop did you use & what lens? Great picture Gary, and well named. Thanks, Thomas. I was at f4 on my 24-105; focal length was 28mm. Hi Gary, reading your story, I got shivers down my spine! This would fit for me too. Cool image-great writing! Beautiful shot! Wish I could have been there.